Yesterday I ran 20 miles for the marathon training plan. Woo hoo, another distance record for me! Only, it did not go so well. Somewhere around mile 14 I wished I were done. By mile 16, I’d officially hit the wall. Bonked big time. What had been a decent pace under 10 minute miles fell off a cliff to 12, 13, 14, and even 15 at one point. I could have walked faster. I refused to give in though. Mentally I felt fine, and I tried as hard as I could to will my legs to move faster. I swung my arms vigorously, but my legs didn’t get the hint. My hips were sore, sore enough to mask the pain I’d already been feeling from the existing groin pull. My legs felt like lead. I simply could not force them to pick up the pace. I shuffled along, determined to make it the full 20 miles. I had to get back to the car no matter what, and I might as well get there as fast as I could. At mile 18.8, a man approached on his bike in the opposite lane, and as he neared me, he called out sympathetically, “You’re doing great!” I thanked him, and promptly burst into tears! I was NOT doing great, but it was kind of him to say so. Thank goodness he didn’t hear me crying to myself as he rode away! I had to wonder what had given me away — did he know I was powering out the last part of a long run because of my compression socks (a dead giveaway for a distance runner) or because of an agonized look on my face? Some combination of both I suspect, but he definitely recognized my sheer determination to finish a tough run. At any rate, it was lovely of him to speak up. After a cool-down hobble/walk, some stretching that required a lot of grunting to get my legs into position, and a torturous climb back into my car, I drove straight to Jamba Juice for a celebratory smoothie. On the way I grudgingly ate a peanut butter and honey sandwich on whole wheat, but it was the juicy goodness of a Five Fruit Frenzy I craved. Ah my love, thank you for helping me recover. You tasted like heaven. 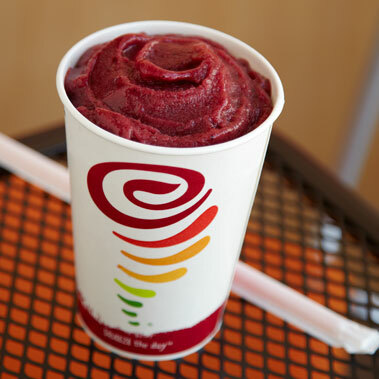 (Photo from Jamba Juice). An all-fruit smoothie — strawberry, banana, blueberry, mango and peach. Perfection. (Man, I wish I were getting paid for this commercial. Sadly, no, I just love me some all-fruit smoothie). After preschool pickup and the drive home, I hopped in an ice bath. Who am I kidding — I wasn’t “hopping” into anything with my sore muscles. But I gingerly climbed in and lowered myself down, and huffed and puffed at the cold. Tip: never combine an ice bath with a smoothie recovery drink. Instant brain freeze (I speak from very painful prior experience). I like to sip hot chocolate in my ice bath. You? Where does all that leave me? Now that I’ve recovered a bit from the bonk death march, I’ve had a chance to think over what went wrong. I thought I’d nailed the nutrition on the run — a mix of four PowerBar and Gu gels, one every four miles, plus two 20-ounce bottles of Fluid (the electrolyte drink offered on the marathon course) and at least two bottles of water. That seemed like almost too many gels, if anything. Correct me if I’m wrong — I’d love to hear if you have ideas to tweak that. In reading about bonking and hitting the wall, I realized my rookie mistake. I didn’t carbo-load the day(s) before the long run. I knew all about carbohydrate-loading before a race, but for some reason it just did not occur to me that I ought to be paying attention to that before a 20 mile run. Duh. Believe me, I will never make that mistake again. So, not the confidence boosting 20-miler I was hoping for, but I learned something and am all the more determined to have a great race day. I will use my taper energy over the next three weeks to fine-tune my nutrition and plan my carbo-loading for the days leading up to the race. I will remember that what didn’t kill me made me stronger. The conditions on race day will be different — over 2 hours earlier in the day, and much cooler weather (I hope). I can do it! Favorite recovery drink? Ever make any rookie mistakes? Do tell.